Synopsis: An easy to read guide to your money, your pension and your tax. 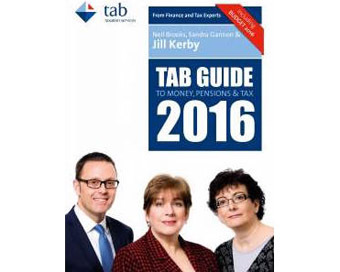 The 2016 edition of the TAB Guide to Money, Pensions and Tax has been launched. It is co-authored by personal finance writer and broadcaster Jill Kerby and tax and finance specialists Sandra Gannon and Neil Brooks. This is the 30th year that the TAB Guide has been published and over that period it has been invaluable to people who wish to manage their personal finances in the best possible way. Chapters cover topics such as PAYE, capital gains tax, buying a home and borrowing and managing debt. This edition also refers to the recent Budget 2016 and how that will impact your finances.